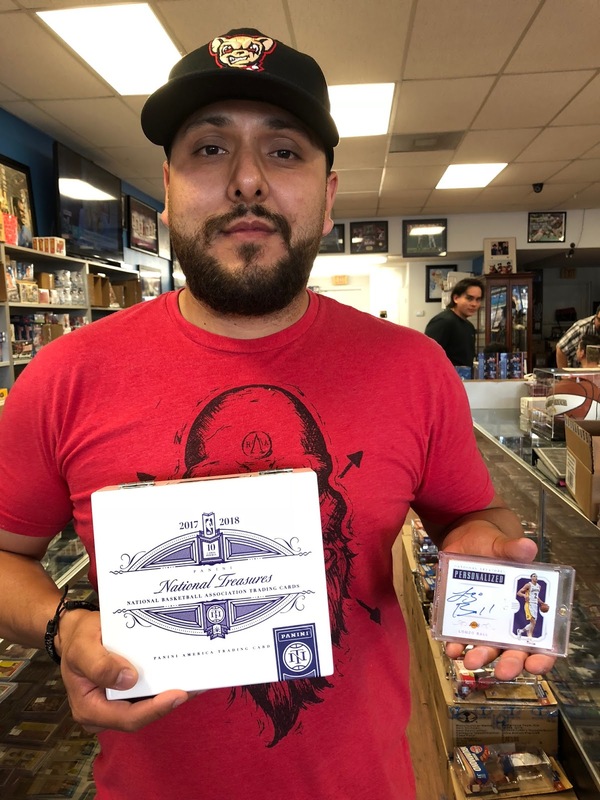 Jesus De Jesus, joins a long list of San Antonio Sports Cards Plus customers who have pulled some of the collecting world's most coveted cards. On Saturday, May 5th Jesus' NBA National Treasures Lonzo Ball One of One Personalized Autograph Card was pulled in a 10-Spot Box Group break which only cost Jesus $110. Needless to say, Jesus' Lonzo Ball 1/1 Personalized Autograph is our best pull from 2017-18 National Treasures NBA Basketball thus far. But never fear, at Sports Cards Plus, a.k.a. The Super Hit Factory we have plenty more Super Hits waiting for YOU. Our next 2017-18 National Treasures 10-Spot ($110 per spot with your option to buy a second spot at a reduced cost) Box Group Break is Monday at 6:15. --- After you pay $110 for your first spot, you will be given the option to accept a second spot at a discounted price with a 10% chance to get a FREE 2nd SPOT. As one of the most spectacular rookie classes in recent NBA history winds down its epic debut season, collecting’s collective focus will gradually begin making its way — as it does every year around this time — to the high-end heat-generators sure to headline a late-season fireworks show. Foremost among them? This year’s National Treasures Basketball and its trademark Rookie Patch Autographs ARE as impressive as the first-year phenoms on them. As is always the case, high-demand Rookie Cards are but one part of the National Treasures experience. This year’s edition features the requisite doses of standout autograph and memorabilia content honoring current superstars and all-time greats that collectors have come to expect. On average, each hobby box of 2017-18 National Treasures Basketball (10 cards per box, four boxes per case) will deliver one base or parallel card, eight autograph or memorabilia cards and one additional autograph, memorabilia card or Printing Plate. The highlights of 2017-18 National Treasures Basketball are many and include . . .
NT’s calling-card RPAs represent one of the hobby’s most sought after chases every year. 2017-18 will be no different. 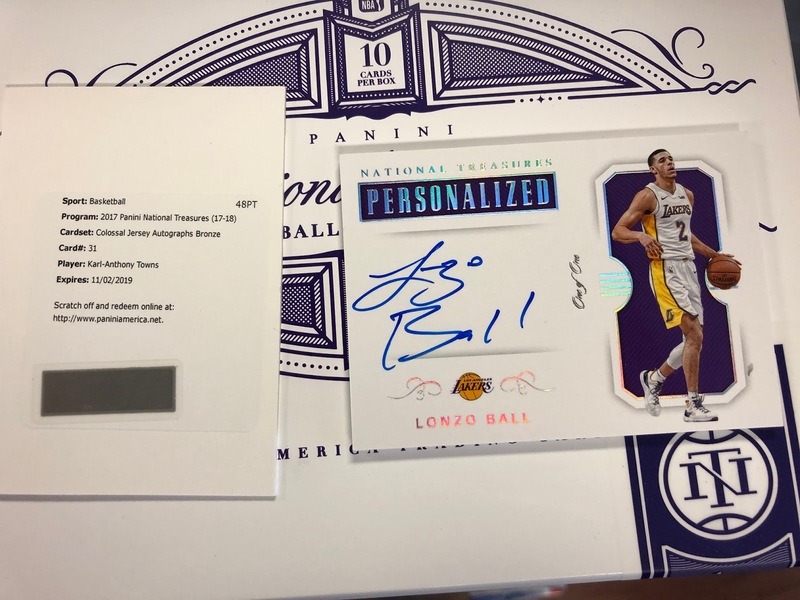 The Colossal Jersey Autographs chase featuring oversized pieces of memorabilia and on-card autographs from the likes of Lonzo Ball, Jayson Tatum, Markelle Fultz, Dennis Smith Jr., Allen Iverson, Kobe Bryant and more.